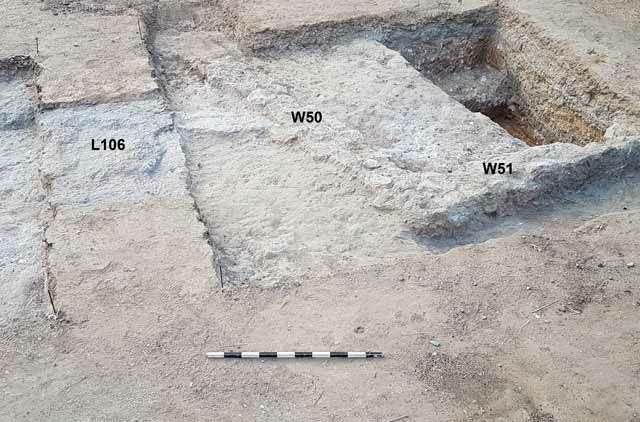 In August 2017, a trial excavation was conducted at the Migdal Ashqelon site (Permit No. A-8077; map ref. 160767–80/619963–70; Fig. 1), prior to construction work. 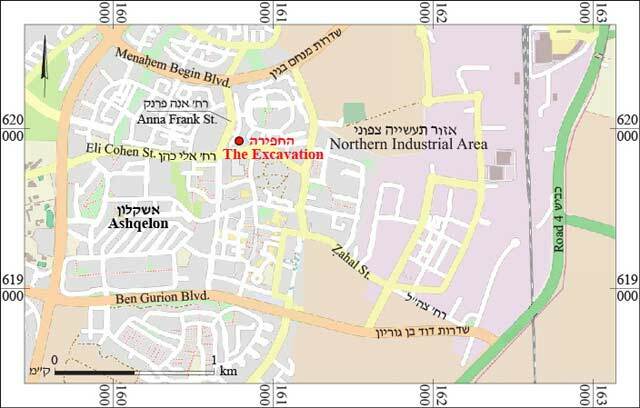 The excavation, undertaken on behalf of the Israel Antiquities Authority and financed by the Liam Nachmias Building Company Ltd., was directed by H. Mamalya (drafting and field photography), with the assistance of Y. El-‘Amor (administration), Y. Shmidov (surveying and drafting), Y. Abadi-Reiss (scientific guidance), I. Lidsky-Reznikov (pottery drawing), Y. Gorin-Rosen and B. Ouahnouna (glass typology and dating), C. Amit (studio photography) and N.S. Paran. 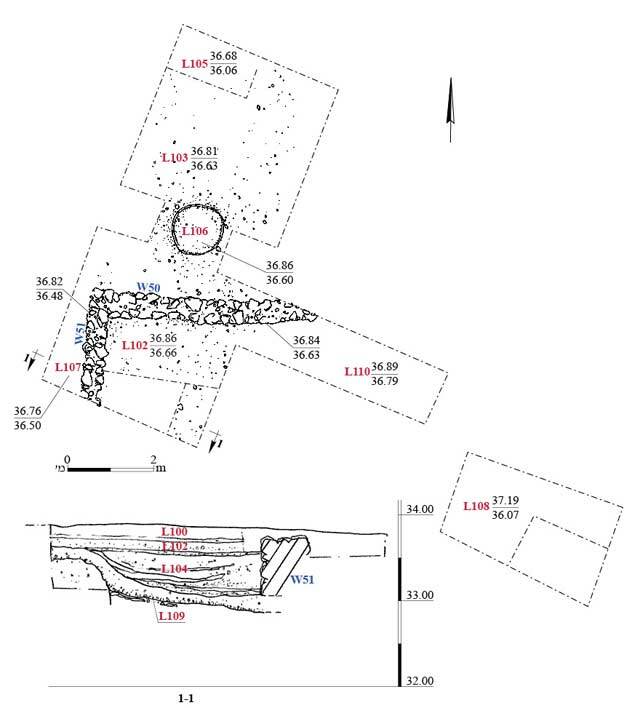 An excavation area (75 sq m; Fig. 2) was opened in the Kokhav Ha-Zafon neighborhood in Ashqelon, in the northern part of the ancient Arab village of el-Majdal. It revealed two building phases from the Ottoman period and the early twentieth century CE. 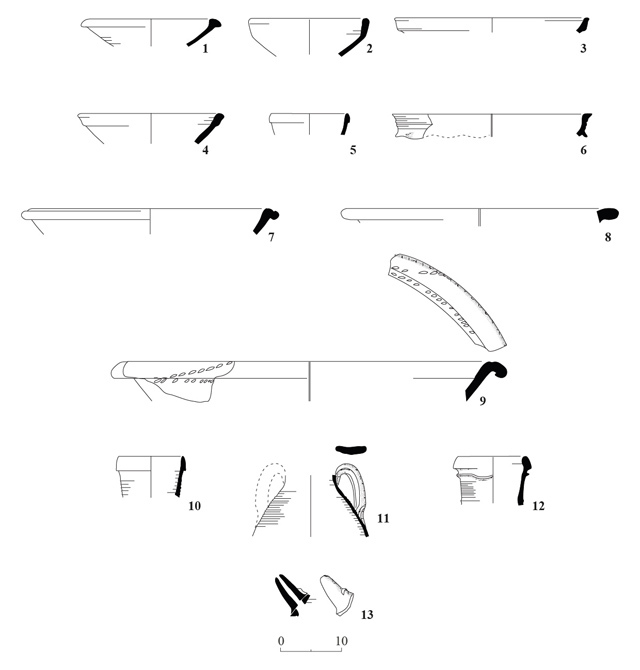 Excavations conducted in the past to the east and west of the site unearthed Chalcolithic potsherds (Nahshoni 1999), Middle Bronze Age II tombs (Gershuny 1996; 1997), a painted Roman tomb (Kogan-Zehavi 1999), a Hellenistic settlement, a Byzantine winepress and architectural remains from the early Islamic period (Haimi 2009; Nahshoni 1999). 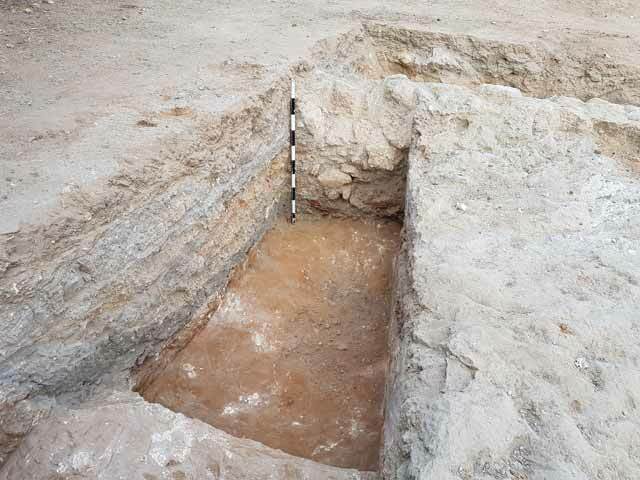 Previous excavations in the courtyard of the Great Mosque at el-Majdal and northwest of the mosque uncovered buildings and installations from the early Islamic and the Mamluk and Ottoman periods, as well as from the early twentieth century (Peretz 2014; Peretz 2017). The earliest architectural phase contained a refuse pit (L109; depth 0.9–1.1 m below topsoil), at the bottom of which lay brownish orange soil that contained light-colored calcite aggregates (Fig. 3). Black Gaza Ware pottery from the Ottoman period recovered from the pit included zavdiya-type bowls (Fig. 4:1) and jars with a plain and pointed rim (Fig. 4:10, 11). 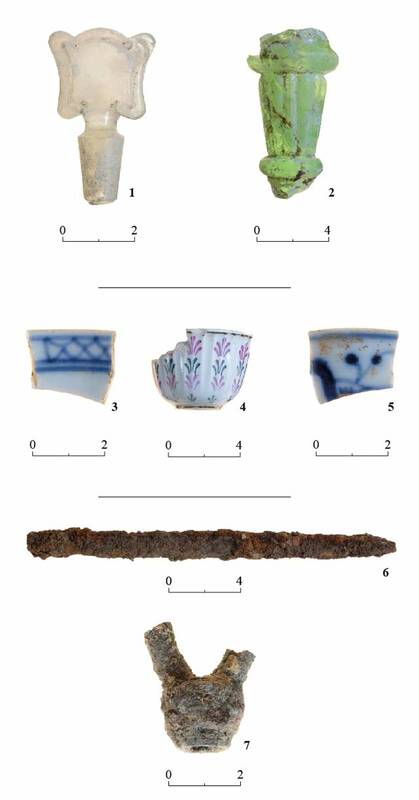 A variety of glass vessels and artifacts were also found in the pit, including a perfume-bottle stopper (Fig. 5:1) and part of a chandelier (Fig. 5:2). It also yielded porcelain vessels, including cups decorated with colorful geometric and vegetal designs (Fig. 5:3–5) and metal items of a type that were still in use in the mid-twentieth century CE. Among these were an iron horseshoe and an iron joint from the end of a shaft that was probably used to harness a cart to a draft animal (not drawn). Two walls (W50, W51; Fig. 6) that formed a corner of a building belong to the later architectural phase. The walls were constructed of two rows of kurkar stones, some of them dressed; their foundations and part of the lower course were preserved. The wall’s foundation, consisting of soil and kurkar-stone fragments, penetrated the refuse pit from the earlier phase (Fig. 7). 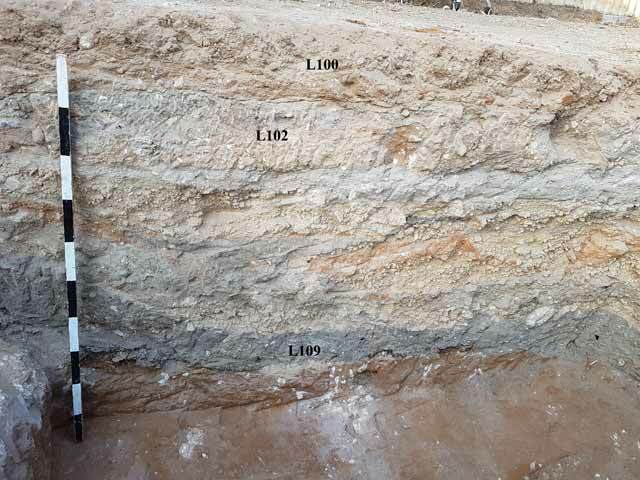 A gray floor composed of soil mixed with lime (L102; 0.10–0.15 thick; see Figs. 3, 6) abutted the walls. 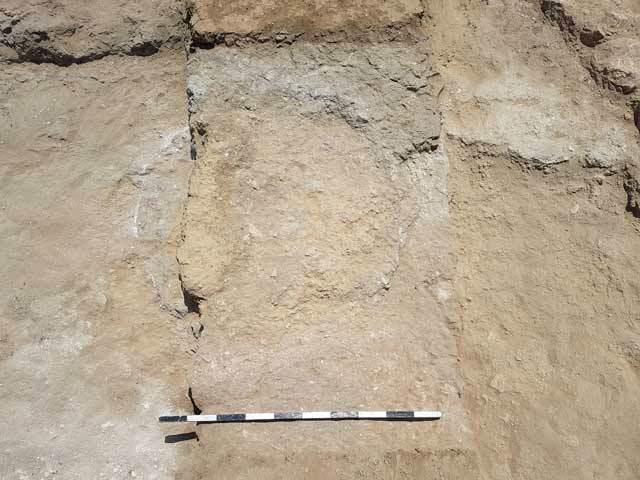 The floor bedding (0.4–0.5 m thick) was made of locally sourced light-brown soil mixed with well-tamped kurkar stones; it yielded a few metal artifacts, including an iron masonry chisel (Fig. 5:6). A courtyard floor (L103, L106) similar in makeup to the one discovered inside the building was unearthed to its north. A metal-alloy vessel with two nozzles (Fig. 5:7) was discovered in the bedding of the floor. A circular installation (silo? L106; Fig. 8) was partially incorporated into courtyard floor. Its wall was cast from a bonding material mixed with lime, and its interior face was lined with tightly packed mudbrick material. Assorted items of Black Gaza Ware from the Ottoman period were found on the floors of the building and the courtyard; among them were two zavdiya-type bowls, one with a simple rounded rim (Fig. 4:2) and one with an upright rim (Fig. 4:3). Also recovered were a bowl with an elongated, protruding rim (Fig. 4:4) and jara-type water jars that have a cylindrical neck with a thumb-indented ridge (Fig. 4:12). Finds from the surface (L100, L101) consisted of a large amount of Black Gaza Ware pottery, including plain bowls with carinated rims (Fig. 4:5); a small, shallow krater with an upright grooved rim (Fig. 4:6); kraters with a curved ridged rim (Fig. 4:7, 8); a krater with a grooved and decorated ledge rim (Fig. 4:9); and the spout of a drinking jug retaining the stump of an upright loop-handle (Fig. 4:13). Gershuny L. 1996. Migdal Ashqelon. ESI 15:131–132. Gershuny L. 1997. Ashqelon, Migdal North. ESI 16:141. Kogan-Zehavi E. 1999. A Painted Tomb of the Roman Period at Migdal Ashqelon. ‘Atiqot 37:181–209 (Hebrew; English summary, pp. 179*–181*). Nahshoni P. 1999. A Byzantine Site in the Migdal Neighborhood, Ashqelon. ‘Atiqot 38:99*–111* (Hebrew; English summary, p. 229). Peretz I. 2014. Ashqelon, Eli Cohen Street. HA-ESI 126. Peretz I. 2017. Ashqelon. HA-ESI 129. 5. Glass finds, porcelain vessels and metal artifacts. 6. Walls 50 and 51, Floor 102 and Installation 106, looking southeast. 7. Wall 51 and Floor 102 above the refuse pit, looking west. 8. Installation 106, looking east.